Belardo was produced with a withering run to claim an impressive victory. A 10-1 shot after finishing only fourth behind the reopposing favourite Estidhkaar in the Champagne Stakes at Doncaster, he was fitted with a hood for the first time by trainer Roger Varian and tracked the speed in the hands of Andrea Atzeni. Belardo moved noticeably well heading towards the last of seven furlongs, and though it briefly seemed he was caught in a pocket, he eventually got the gap he required and quickened up smartly to seal a comprehensive victory by two lengths. Kodi Bear filled the runner-up spot, finishing clear of Smuggler's Cove in third, with Estidhkaar ultimately disappointing in fourth. Atzeni said: "We've always liked him a lot. He was a little bit disappointing at Doncaster, maybe the ground was too quick. He settled a lot better than last time so that (a hood) probably helped." Varian added: "He's a super horse and we are so delighted for him and the owner. "I probably had him too fresh at Doncaster and he raced too fresh - he was too keen and too exuberant. They've gone a better gallop today and he switched off." 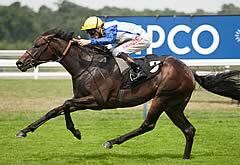 Trainer Clive Cox said of Kodi Bear: "I'm so pleased with him, and the team have done a great job. He ran a huge race and I can't wait to see him over a mile now. He's going to keep us all going through the winter." Aidan O'Brien, trainer of third-placed Smuggler's Cove, said: "We had thought we'd either run next weekend or this, and he ran a good race. I'd say that was it for the season."